This is the goal of the province’s master plan on tourism development until 2025, with a vision to 2030. Ninh Binh looks to attract 1 million foreign arrivals and 7 million domestic visitors by 2020, 1.5 million and 9 million by 2025, and 2.1 million and 11.2 million by 2030. Meanwhile, tourism revenue is expected at over 4.2 trillion VND (US$179.7 million), 11.8 trillion VND (US$504.8 million), and 27 trillion VND (US$1.15 billion), respectively. Under the plan, the province will turn Ninh Binh city into the main tourism center while Tam Diep city and townships in Hoa Lu, Gia Vien, Nho Quan, Yen Mo, Yen Khanh and Kim Son districts will be developed into supporting centers. 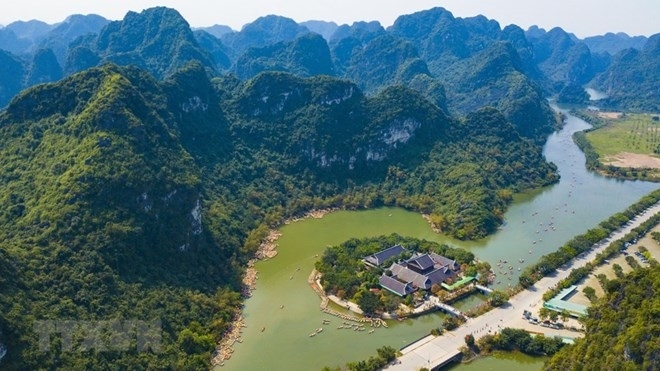 To realize this plan, Ninh Binh is set to ask for the Government and relevant ministries’ permission to apply some special preferential policies to attract investment to tourism. Provincial authorities also called on the Ministry of Culture, Sports and Tourism to further include local tourism information in promotion programmes for Vietnamese tourism and support Ninh Binh in training human resources, expanding markets and products, and protecting the environment. Ninh Binh province is an increasingly favourite destination of tourists from across Vietnam and other countries. It is home to many renowned landscapes, historical relics, traditional craft villages, and various specialities. According to the provincial Department of Tourism, Ninh Binh welcomed more than 7 million visitors and earned over 2.5 trillion VND (US$107 million) from this industry in 2017, respectively rising by 9.5 percent and 43 percent year on year. In the last eight months, over 6 million vacationers chose Ninh Binh as their destination, helping the province gain 2.3 trillion VND (US$98.4 million) in tourism revenue, up 5 percent and 18.8 percent from the same period last year, respectively.